The possibilities and pitfalls of a big night out in Tokyo. To be honest I didn’t notice that part either at first. Very pleased when I did though. And yeah, in their own way that might well have been the case! If this weren’t Japan, I’d think it was staged. Great photo. I know eh? Everything was perfectly set up. Tokyo is so good for unexpected finds like this. A city that photographically at least, just keeps on giving. I really like the guy walking down the street amidst all this. I think it makes the picture, imho. Yeah, totally agree. Got this shot, and another without him in it. And this one works much, much better. Those two guys sleeping the foreground look surprisingly comfortable! 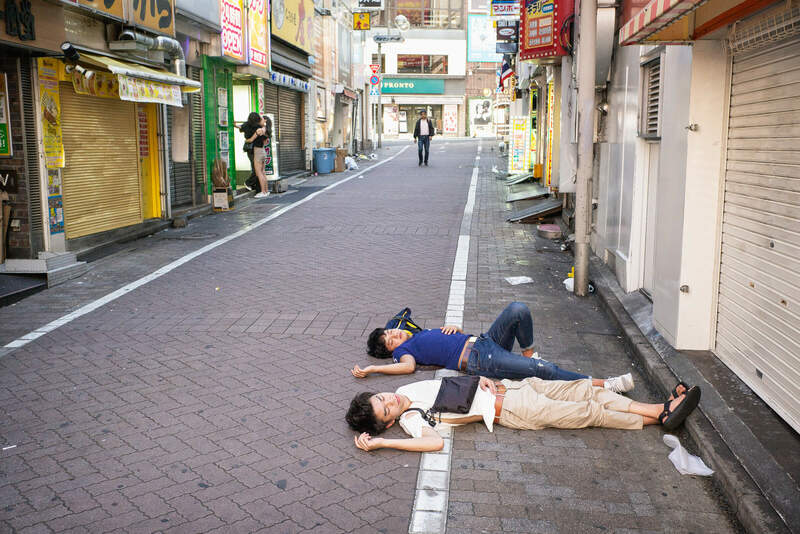 I wouldn’t be surprised if they woke up without massive hangovers despite their clearly having imbibed so much the night before that they decided it was extremely logical/rational/acceptable to make the street their bed! I know eh? That’s what struck me at first. Just as though they were lying in bed, not in the middle of the street. Haha, quite possibly. Especially as they could have been asleep there for hours! Thanks! Yeah, very contrasting stories eh? Incredible scene. Essence of a Tokyo youth-life summer, despite it being pretty much a deserted shopping alley. How do those guys look so comfortable? They could be on a beach. Amazing. I know. The lad in blue rolled over after I took this. And he looked so comfortable. Are the lovers exiting a love hotel? The whole scene seems quite a romantic and idyllic view of reality. Great job! Thanks. Very happy to have stumbled upon it. No, I don’t think so. Didn’t go past, but it’s a bar I think.